Brand new 'Special Edition'! 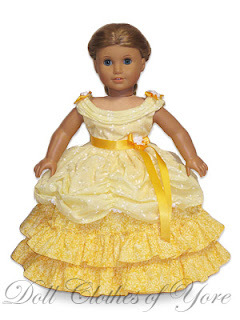 I have redesigned the classic 'Southern Belle' Dress. It is made from light yellow embroidered eyelet fabric and yellow calico! It's a yellow (or 'Beauty and the Beast') lover's dream! But - it's only here for as long as supplies last. Right now there are only 2 available, so don't miss out! The New 'Southern Belle Dress' and Other Things. I'm sorry for the lack of blog posts recently, but I have been so busy over here just trying to keep up! I've got several new designs for the Fall Collection that I'm excited about, but I haven't quite gotten the time to do them yet, but hang tight! I would like to have the Fall Collection out by the beginning of September, but in the meantime, I have a special edition that will be released on July 23rd! It's similar to our classic design 'The Southern Belle Dress' which was originally inspired by Belle in the Disney film, 'Beauty and the Beast'. There will only be three available, so keep watching! Hello to the wonderful world of the Internet! I am home once again, this time for a much longer period. I am looking forward to getting back to my sewing machine and my design drawing board. Hopefully I will get a little more caught up this time! One of the things on my list is to design several new 'Anne of Green Gables' inspired outfits. Therefore, I will be watching the classic film version starring Megan Follows. It is the best version by far in my opinion. The process of getting new designs out takes several weeks, so don't look for anything new too soon! I am still rebounding from the HEAV convention! 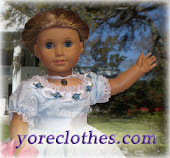 For all of you out there who read this blog, what would you like to see turned into a doll dress? Please, throw your ideas out there and I will consider them!